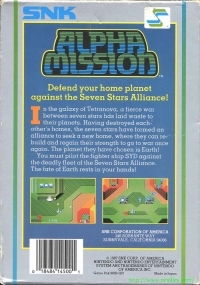 Box Text: Defend your home planet against the Seven Stars Alliance! In the galaxy of Tetranova, a fierce war between the seven stars has laid waste to their planets. Having destroyed each other's homes, the seven stars have formed an alliance to seek a new home, where they can rebuild and regain their strength to go to war once again. The planet they have chosen is Earth! You must pilot the fighter ship SYD against the deadly fleet of the Seven Stars Alliance. The fate of the Earth rests in your hands! 07-31-2015 brodus Box Text Defend your home planet against the Seven Stars Alliance! In the galaxy of Tetranova, a fierce war between the seven stars has laid waste to their planets. Having destroyed each other's homes, the seven stars have formed an alliance to seek a new home, where they can rebuild and regain their strength to go to war once again. The planet they have chosen is Earth! You must pilot the fighter ship SYD against the deadly fleet of the Seven Stars Alliance. The fate of the Earth rests in your hands! 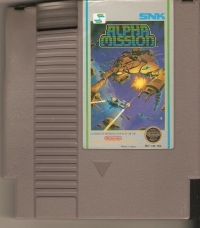 This is a list of VGCollect users who have Alpha Mission (3 screw cartridge) in their Collection. This is a list of VGCollect users who have Alpha Mission (3 screw cartridge) in their Sell List. 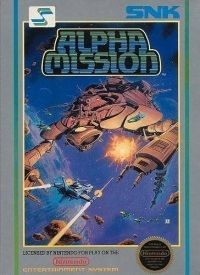 This is a list of VGCollect users who have Alpha Mission (3 screw cartridge) in their Wish List.